We’ve shown you costumes for the game before. We’ve shown you increasingly refined models and shown them in increasingly smooth motion. And we’ve introduced elements of the rich variety of lore and factions we’ve built to bring City of Titans to life before. 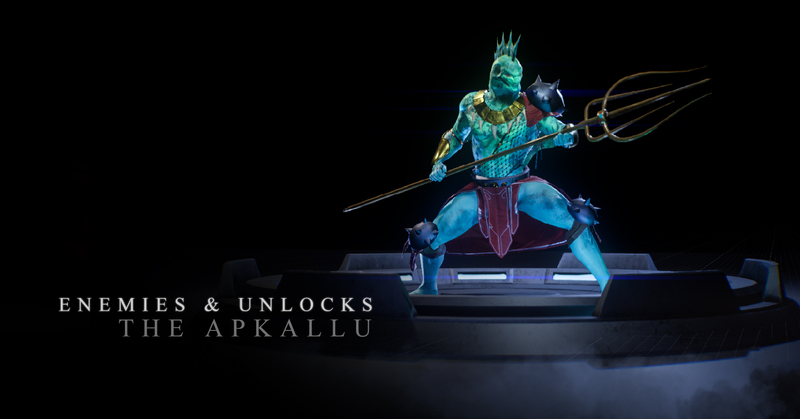 Today, we present all of that at once: we present to you the Apkallu, a race of superhuman fishman, complete with a fully realized, game ready model featuring many costume parts that you, the player, will be able to unlock and use. Including that monster head it’s wearing. 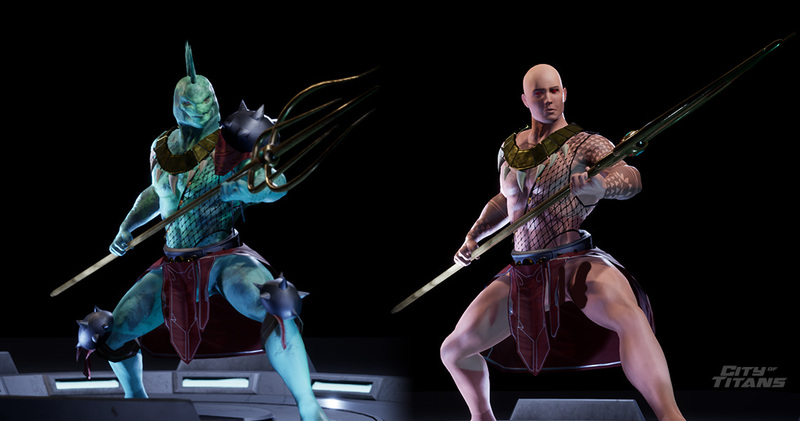 In fact, the Apkallu and this update introduce a variety of costume features that players will have access to, including Monster Heads, Tattoos, Pit Wings, and Asymmetric Costume Pieces. Details can of course still change prior to release. The Apkallu wish to claim their rightful place as rulers of humanity, though quite a few Apkallu are content with flooding the city and wiping out human civilization. They use magic to seek out individuals with the Blood of Kings to swell their ranks, unlocking their powers and then brainwashing them. A full blooded Apkallu does not wear much of anything. Most true Apkallu resemble regal looking fish people with powerful builds, and tend to wear ornate loincloths and little else. Female Apkallu continue to wear binders, but men typically go shirtless. Apkallu favor nautical themed weaponry, like Harpoons, tridents, nets… even anchors on rare occasion. Many of these are inscribed with cuneiform in order to enchant them. As we've briefly mentioned before, our character model is itself modular, which means we can swap arms, legs and even heads for things like robot or monster parts. Apkallu marks the first implementation of the “Monster Heads” we will have in the game. 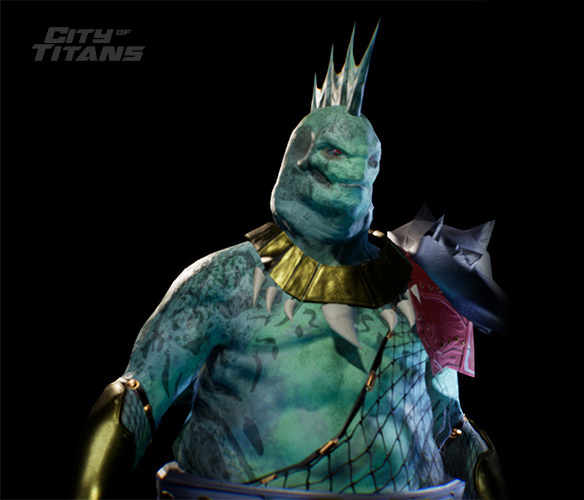 These heads tend to be unique and are affected by certain choices made on the player character’s skin. 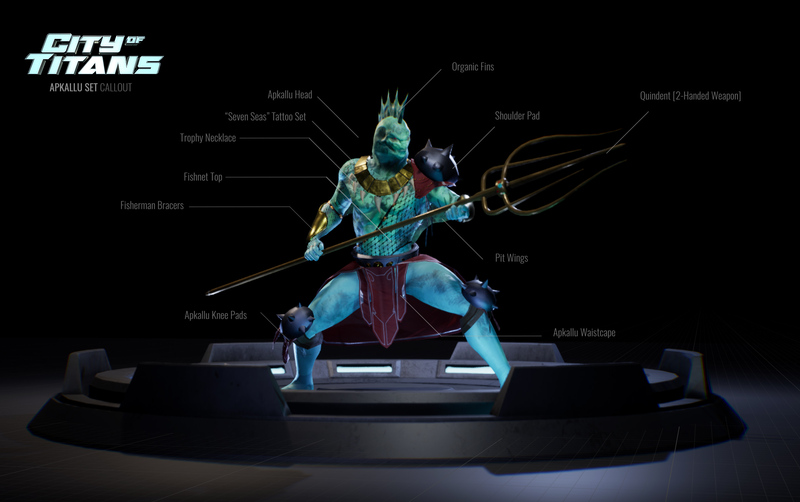 For example a character with metallic skin, will also carry the skin qualities over to the other organic parts of the character, with protruding costume pieces such as fins, pit wings, spikes and such. While we aim for quite a few monster heads to be able to share details with the rest of the body, it is a challenge with vastly different heads such as worm and snake heads. These modular body parts also respond to sliders such as Weight, Muscle and other details, allowing both players and devs to take the possibilities that much further. Tattoos are not everything we would like them to be: overhead costs have forced out allowing free placement, although we'll provide as many choices as we can. We'll be able to offer color control, but not material. On the other hand...you can make them glow. Right now the tattoos are full body sets, but the goal is for you to be able to select tattoos for different parts of the body. This set also comes with a long-requsted costume piece called Armpit wings, or Pit Wings for short. While the Apkallu Set features the Organic variant that takes on the skin properties, just like the head fins, these items will have “craft” variants as well, that utilize the Character Generator’s powerful material capabilities. Project Integration was delayed quite a while thanks to underestimating some challenges in setting up the new plug-in project hierarchy and an Unreal feature that never materialized, but now that it's finally coming together, we look forward to showing you even more of what we've been, and are, accomplishing. Credit to Charles Logan, our Art Lead, and Jamie 'Geeksgonebad' Cunningham, Developer Extraordinaire and Real Life Ninja, whose combined efforts pulled all this together within weeks of hearing the obstacles were clear. Hang around to see how much more we can do in a month.